As seen in the Wall Street Journal: myNoise® is free, with White Noise, Rain Noise, Ocean Noise, Binaural Beats, Spring Walk, Temple Bells, Tibetan Choir and Warp Speed, the ultimate white noise machine for Sci-Fi fans. 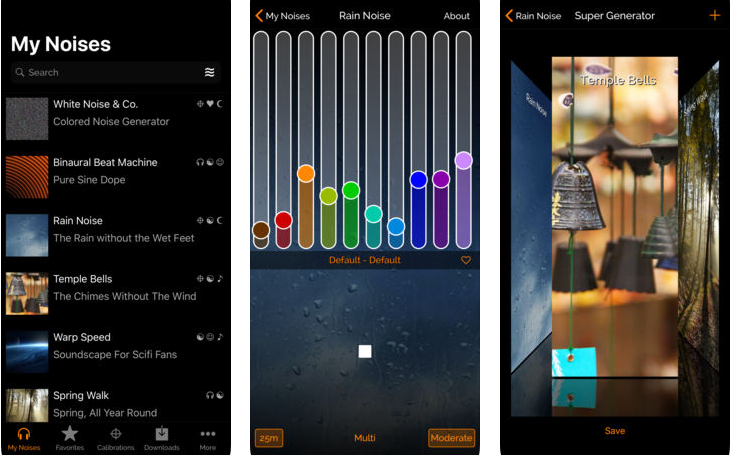 ‣ “Of all the ambient noise apps I’ve tried, myNoise is the best. It never repeats, it has top-notch sounds, and it is just plain fun to use.” – Cult Of Mac. ‣ “We’ve covered many online noise generators in the past, but myNoise is different: it calibrates background noise based on your hearing range and listening devices.” – Lifehacker. Noise machines can be used in a variety of ways throughout your daily lives, and can be used by all audiences. They can not only help you focus while working in a noisy environment or help to settle your anxiety, but they are also useful in cases of insomnia or tinnitus. Fortunately, you don’t need a specific reason to start listening to myNoise! Compared to conventional noise blocking machines, myNoise generators can be shaped to the frequency characteristics of the audible nuisance that disturbs you, and therefore achieve a better camouflage, or – in other words – a greater masking efficiency at quieter levels. myNoise will cover background noises whether you’re trying to work, study, relax, or sleep. Some of our noises are truly special: our so-called calibrated noise generators cover the entire audible frequency range, from 20 Hz to 20 kHz, over 10 color-coded octaves. Thanks to our unique calibration procedure, each calibrated generator can be made spectrally flat to your ears. As we get older, we all suffer from age-related hearing loss involving the higher tones. During the calibration procedure, we are able to measure your personal hearing levels, and adapt our calibrated noises – such as the rain noise – accordingly. You’ll be surprised to hear frequencies you thought were lost forever! We regularly add new generators that you can find in the Download tab. Check them out, some of them are free to download. If you are a noise enthusiast, purchasing the “All You Can Hear” package guarantees that you will get unlimited access to all generators, including future ones. There are more than 150 generators available for download today, including 40+ calibrated ones. Enjoy!